'Plum Quirky' (Riley Probst, R. 2005). Seedling #93WRX16PQ1. MTB, 25" (64 cm), Late midseason bloom. Standards and style arms yellow, Standards ruffled; falls. creamy white ground vividly veined and washed plum purple 3/4 of way down, slight gold rim; beards yellow, near white at end; ruffled, flared; slight sweet fragrance. 'Welch's Reward' X 'Pretty Quirky'. Probst, Miller's Manor 2005. Honorable Mention 2007, Award of Merit 2009; Williamson-White Medal 2012. From AIS Bulletin #337 April 2005 PLUM QUIRKY (R. Probst) MTB, M-L, 25". Crisp bright yellow Standards and style arms sit atop Falls of creamy white vividly veined and washed a brilliant dark plum purple. Yellow beards. Blossoms are wonderfully flared and ruffled. Outstanding 9-13 bud. 93WRX16PQ1: Welch's Reward X Pretty Quirky. $20.00. Miller's Manor Gardens. From AIS Bulletin #337 April 2005 PLUM QUIRKY. Standards and style arms are bright yellow, edges are ruffled. Inside of standards show a few darker veins at the base. Falls carry a beard that is marigold yellow in throat to near white at the ends. The ruffled and flared falls are creamy white ground vividly veined and washed plum purple. It has a slight gold rim. Plum Quirky is triple socketed & consistently has nine to thirteen buds with two open at a time. It has good garden appearance, with the floating butterfly look that is seen from a distance. In Missouri where winters are cold and long and summers are rainy and humid increase is 3: 1; on the west coast in the Fresno gardens increase was closer to 4:1. Stalks are show bench quality, with three, sometimes four branches. 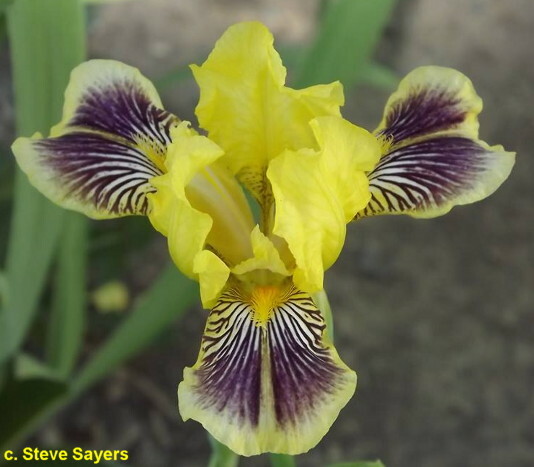 It is an all around appealing iris, excellent for showing off in the garden or on the show bench. This is one of the first truly ruffled MTB's. Fertile both ways. $20.00. Miller's Manor Gardens. jpg IMG_9566-X2_plum_quirky.jpg manage 435 K 18 Feb 2016 - 23:26 BrockHeilman Please contact Brock Heilman for image use.